What does your prayer life look like? Do you pray? For what do you pray? How often do you pray? Questions like these used to scare me. When I was a young teenager, my prayer life consisted of me praying as I was going to bed. I would lie down, close my eyes like I was going to sleep, and start praying. Usually, I would end up going through the events of my day praising God for what he had done while praying for the next day. Most nights I didn’t make it five minutes before I fell asleep. Now that I am older, my prayer life is more than me praying at the end of the day, while I am about to fall asleep. If you are curious as to what methods I use to help strengthen my prayer life, then check out this post: My Prayer Time. Part of my prayer time/ life is repentance. This is probably the most skipped part of anyone’s prayers. I know this because when I was younger my prayer time lacked this crucial act. I would pray for myself (needs, desires, and various other things), I would pray for my family and friends, and I would praise God. However, I don’t recall, at least before the age of 14, having my prayer life include repentance. Now, that’s not to say I wouldn’t repent, but it is to say that I didn’t in prayer. This was mostly due to the fact that I prayed before falling asleep…. I would encourage you all to not follow that pattern. Instead, be like the psalmists, who so often would call out to God in prayers of repentance. They would repent for themselves, but they also repented on behalf of the whole nation of Israel. What would it look like if Christians did the same for themselves and for the nation they call home? I am almost positive that Christians would be more humble. I am almost positive that Christians would be more humble. Repentance is a humbling thing. It requires that we say we were wrong and God is right. We acknowledge that what we did (sin) was what God’s Word tells us not to do or that what we didn’t do was what God’s Word tells us to do! Repentance requires that we be specific as to what we are repenting. Imagine your spouse is angry with you for doing/not doing something wrong/right and all you say to your spouse is, “I’m sorry.” What does that tell your spouse? Are you really sorry or are you sorry you got caught? For what are you sorry?Be specific. Spell out what you did wrong, or didn’t do right, plainly. Repentance requires a change of course. Perhaps you know this already, but the Hebrew word for repent is שׁוב or for you non-Hebrew students, it sounds like “shoov”. It means to turn back or return. When someone repents they are stepping off the path they are on to return to or turn back to another path. Biblical repentance is the abandoning of your own path in order to turn, or in the Christian’s case turn back or return, to the path of life. Biblical repentance is humbling. We admit that the path we are walking is not the path God requires us to walk. We turn back to his way. Biblical repentance is specific. We tell God exactly what we did wrong since there is no use in hiding it from him. We say more than, “I am sorry.” We say, “God, I am sorry I did _________. It was foolish and sinful. It offended your holiness.” Then, biblical repentance requires change. To be short, repentance requires you to “Stop it!” Stop sinning. So, does your prayer life include repentance? 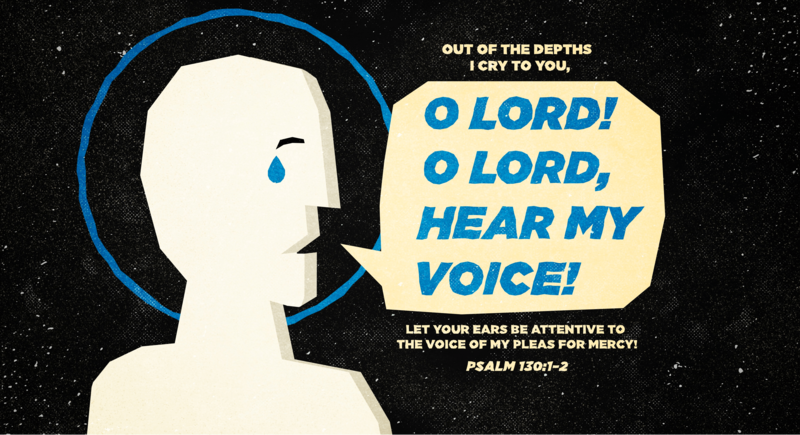 Does it reflect that of the psalmist in Psalm 130? Do you call out to God in pleas of mercy? Let me tell you, it is so reassuring to know that the LORD does not hold our iniquities against us in Christ. In Christ, there is forgiveness. With him, there is hope and plentiful redemption. Heed his call to repent. Humble yourself before him and he shall exalt you. Admit you sinned against him and he will forgive you. Return to The Way, The Truth, and The Life, in whom all the promises of redemption are plentiful.